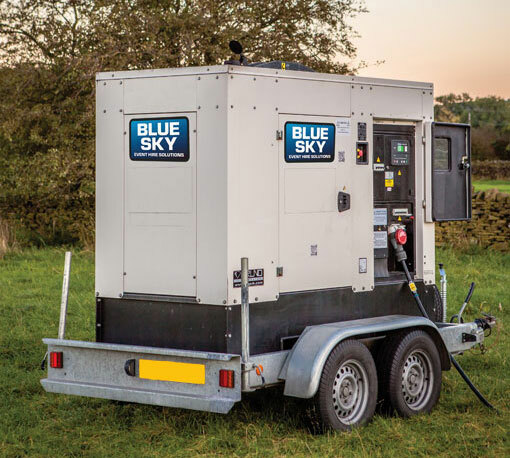 Our specialist events team have built up a well-respected reputation for providing temporary outdoor power hire for a variety of Events. We hire to major festivals, Food and Agricultural shows, Marquee weddings, corporate events, film and TV crews, AV firms, and outdoor sites. 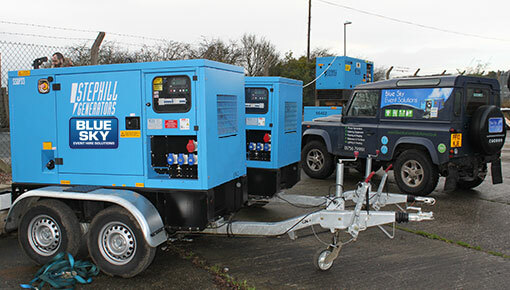 Our Generators are designed for the events industry. They are quieter than average Generators with large bunded fuel tanks for longer running times. Blue Sky have provided a large amount of infrastructure for Deer Shed Festival since our first year. They are still very much at the heart of the event and we doubt that it could run quite as smoothly as it does without their support and expertise. It can be daunting when faced with power requirements for outdoor events. With qualified electricians, a team that is used to asking the right questions and a fleet of event spec equipment we can help. We will make this process of your event as easy as possible offering support and expertise so you get exactly what you need to power your event. We also offer an electrical set up which includes communicating with all your suppliers to determine all electrical needs and streamline the logistics, full set up of the generator, cabling and distribution and testing of the equipment on site. Meetings with organisers to help make electrical planning as easy as possible. Onsite support for the duration of the event. We have looked at some of our most common generator questions and provided you some answers! Our trained electricians can carry out full site surveys. They will be able to give you the best options for both your needs and budget. All our generators are ‘Event Spec’ they are the quietest on the market with long running tanks. All equipment is thoroughly checked and tested before each hire to ensure your event runs without a hitch. In the unlikely event of a failure we provide emergency call out coverage and support available at an additional cost. Blue Sky are very professional, friendly and reliable they take time to find out your requirements, offer practical and informed advice and then deliver as promised. They bend over backwards to ensure you get what you need and when you need it. I would highly recommend Blue Sky to anyone looking for a quality service. Having Blue Sky’s onsite technician made sure the festival went without a hitch. His professionalism and ready-to-help attitude made him more than a contractor and part of the KMF team.